Traveling Zimbabwe is a great way to experience the wonders that southeastern Africa has to offer. Although the last decade has seen Zimbabwe in economic decline; the country features a great many natural wonders that make it well worth a trip. Furthermore, because much of the best attractions are natural wonders found along the vast landscape of the country; choosing a Zimbabwe 4WD campervan hire with Britz Motorhome Rentals, Kea Campervan Rentals or Caprivi Car Hire is the best way to truly experience the beauty of this landlocked country. When traveling in your Zimbabwe 4Wd campervan hire or motorhome rental, the first must-see site is Victoria Falls. During the February through April season, Victoria Falls experiences high amounts of rainfall; creating a beautiful curtain of water with mists that rise up high enough to see from 32 kilometres away. Between Victoria Falls and Bulawayo, Zimbabwe’s industrial and business hub, lies Hwange National Park located some four hours southeast of the magnificent falls by 4WD campervan rental in Zimbabwe. This park boasts over 400 species of birds, and 100 different species of animals. 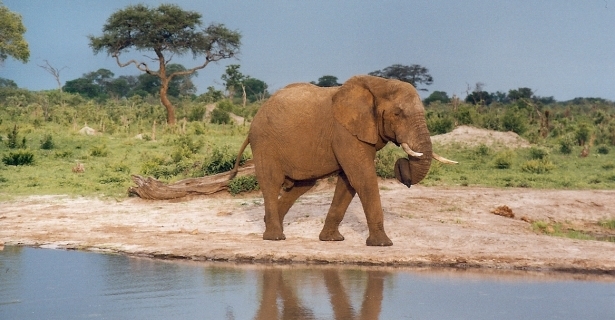 It is also the scene of one of the very few grand elephant reserves in Africa. You’ll be hard pressed to find better access to Africa’s elephant population; and finding a better place to view a large number of African animals won’t be easy either without a 4×4 camper hire in Zimbabwe. Once you’ve taken in the sights in Victoria Falls, head out to the historic ruins of Great Zimbabwe, a UNESCO World Heritage Site and purported to be the ancient capital of Queen Sheba. This area offers a look into ancient Southern Africa, and was once the center of the Monomotapa Empire. Another fantastic site that showcases the natural beauty of Zimbabwe with a touch of British air is the Eastern Highlands. Drive your 4WD Zimbabwe campervan hire out to the Eastern Highlands; where you can experience the gorgeous cloud-topped mountains that border nearby Mozambique. Hike around the area to get a closer look at the local nature, and then visit Chimanimani, a charming little village close to the Mozambique border whose mountains abound with endemic plant and bird species. If you’re looking for a break from the great outdoors; finish up your tour of the Eastern Highlands and drive your 4×4 camper rental in Zimbabwe out to Harare, the capital and largest city in the country. Harare offers a look at local city life influenced by British presence in the 19th century; and offers an array of shopping, restaurants, and cafes. Duck into some of the smaller family restaurants for a true taste of ‘bota’ (porridge), ‘biltong’ (jerky) and Boerewors (sausage). If you’re feeling adventurous; pick up some food for dinner and take it back to your 4WD Zimbabwe campervan hire for a do-it-yourself cooking. If you are ready to take in some more wildlife, check out Kariba along the northern border of Zimbabwe with Zambia some 160 miles from Harare. It’s an excellent location to take your 4WD campervan hire in Zimbabwe out to; because Kariba offers a unique mix of natural wildlife and interesting fish species, and a large (man-made) lake you can explore by boat.